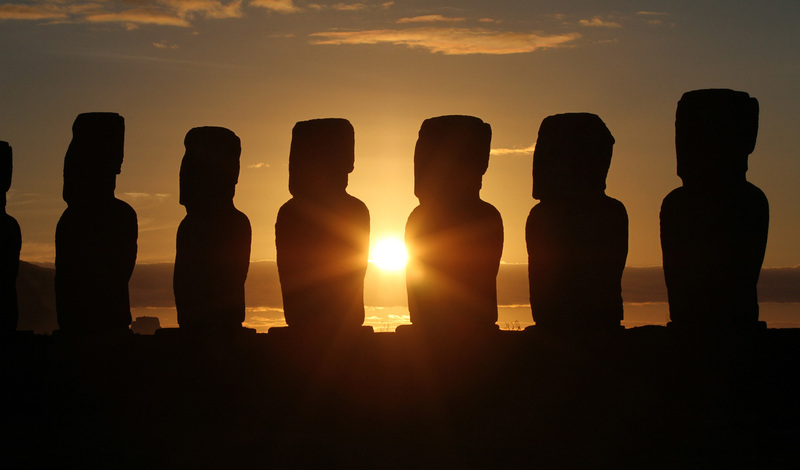 Chile is a country as diverse as it is long and you can experience all of its many wonders on this 10-night luxury adventure trip that will take you from Santiago to the Atacama Desert to Easter Island. Are you ready? Landing in Santiago, you’ll spend one luxurious evening in the vibrant capital of Chile, before flying to Calama and seeing the wonders of the Atacama Desert the next day. Upon arrival, you’ll have a few hours to settle in and gear yourself up for the days of adventure ahead. Then, when you’re ready, it’s out into the desert lands as you embark on an insightful archaeological tour of this dusty, historic region where you’ll be lead into fortress ruins dating as far back as 1000 AD. The Quitor Pukara is one of the area’s most impressive fortresses and a particular highlight of the route you’ll take. As you ascend the ruins, enjoy views of the spectacular Andes and the San Pedro River beyond. It’s an astoundingly beautiful way to begin your Chilean adventure. Wake early and set out on horseback in the direction of the Quitor Oasis. You’ll be riding on a narrow dirt road towards Death Valley, so try not to look down too much. Even if you do suffer from a little vertigo, you’ll quickly realise that the incredible panoramas are worth the fear. When you reach Death Valley itself, hop off your trusty steed and make your way to the top of one of the sand dunes. Here you’ll be strapped to a board and instructed on how to reach top speeds as you sandboard down a steep dune. It’s an adrenaline-inducing experience that’s perfect for the self-proclaimed adventurer. More natural beauty awaits you in the afternoon as you head out on a trip to witness the unique geology of Chaxa Pond, a National Reserve located at the Atacama Salt Flat. A body of water that’s surrounded by salt crusts and gypsum formed during the evaporation process, the pond also happens to be the home of a group of flamingos. Travel here at dusk and the views from the pond over the Domeyko Range, the Salt Range and the Andes Range will be awash with orange hues. A sight you’re not likely to forget in a hurry. After a relaxing evening at the beautiful Hotel Awasi, you’ll be up before sunrise to journey to the Geothermic Camp of Tatio. Here you’ll come face to face with a range of underground hot springs that stream out at random moments in the form of steam and hot water columns. It’s sure to be like nothing you’ve ever seen before, so take your time to marvel at these natural wonders before enjoying a sunrise breakfast and a day filled with yet more natural beauty. Your last day in the Atacama region will end with a hike up Taco Hill, located between Juriques Volcano and Chanjnantor Hill. The ascent itself isn’t too difficult; it is the altitude and the chilly temperatures that present the real challenge, so we’ll ensure you’re all wrapped up and fully kitted out with the appropriate mountain-wear. The conditions will be worth it once you reach the summit, however, as you‘ll be treated to views that reach as far as Laguna Blanca in Bolivia. Your days exploring the desert landscapes and mountain regions of mainland Chile have come to an end, but chin up because you’ll be spending the rest of your trip on one of the most bucket-list worthy destinations on earth; Easter Island. Your days on this famous and enchanting island will be spent hiking up historic hills and cycling past plantations to colourful towns. One hike will take you to Cerro de Pui, whose trail winds through fields and passes archaeological sites before ending at the Ranu Raraku Moai quarry. Here you’ll finally come face to face with the iconic carved heads that the world has come to associate with this remote part of the world. An overwhelming look at the triumphs and skill of past civilisations; Easter Island will inspire you with both its natural beauty and historic highlights. We will also ensure you get the opportunity to climb Maunga Kuma and the Maunga Terevaka, the highest point on the whole island. When you reach the top, look out over the entire island and the sparkling Pacific Ocean beyond and marvel at just how remote and tranquil this island is. It’s a wonder that humanity ever reached these far-flung plains in the first place, all those years ago. 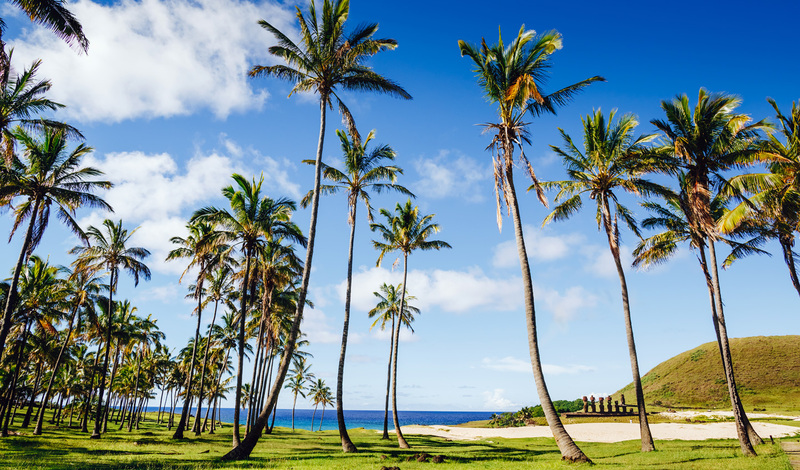 When you’ve clambered back downhill, reward your hiking efforts with a stint on Anakena Beach, swimming in the turquoise waters and relaxing in the shade of the palm groves. A well-earned relaxing end to your exploration of Chile, one of South America’s many jewels.